Highway Entertainment is pleased to announce that the Photo Cube 4 in 1 is now available for sale. This innovative machine is a photo booth with four different functions: Fun, Mobile, ID and Print. 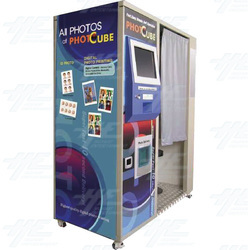 Photo Cube machines are priced at $13,995usd per unit and come with a twelve month warranty. Fun Mode allows users to edit their photos with a number of different effects such as colourful frames and stamps. These photos can then either be printed or saved to the user's storage device. The Mobile function allows users to import photos wirelessly from their mobile phones using Bluetooth or Infared. These photos can then be printed, edited in Fun Mode or transferred to an alternative storage device. In ID Mode, the machine takes portrait photos of the user that can then be printed in a number of different sizes. These photos can be used for passport applications and other identification purposes. Print Mode allows the user to print copies of their photos with or without effects. Photos can be printed in standard 4x6, 6x8 and 6x9 inch configurations. Index prints are also available, with up to 24 photos displayed on the one page. The machine features a 7 mega pixel digital camera, 15 inch TFT LCD touch screen monitor and a dye sublimation digital printer. Photo Cube is compatible with a wide range of mediums, including CD-ROM, Compact Flash Card, Secure Digital (SD) Card, xD-Picture Card, Memory Stick, Memory Stick Pro, Smart Media Card, IBM Micro Drive, Bluetooth and Infared. Photo Cube has support for over 8 different languages (including English, German, French, Turkish, Hebrew, Spanish, Russian and Arabic) making it suitable for locations all around the world.